When the evolution of punk is raised at suburban dinner parties, it is usually discussed as a movement of the musical zeitgeist in the mid-1970s, located in the United States and Great Britain. You’ve heard this kind of thing said over the croquembouche many a time. Not only does this leave out Australia’s undeniable contribution to the scene, but it also excludes cities like Belfast, Northern Ireland. GOOD VIBRATIONS is the story of Terri Hooley, a man who was a lynchpin of the Belfast punk scene. In a dazzlingly fast introduction we get a feeling for Hooley’s childhood and we are left in no doubt of his passion for music. The story progresses quickly to the 1970s and into the depths of The Troubles. Hooley has no interest in sectarian violence and tries to walk his own path. By not taking a Protestant or Catholic side, he finds himself with few allies and in potential danger. Some of his friends leave Belfast, but Hooley makes the decision to stay in the city he loves. Rather than keep his head down, Hooley opens a record store called Good Vibrations. At first, he is motivated by the spirit of reggae. He feels music will bring together those, like himself, who don’t want to fight. One day, Hooley has an epiphany, he discovers the local kids don’t give a toss about reggae or any of the old music he stocks at Good Vibrations. Their music is punk. The more Hooley learns, the deeper he gets involved in punk. Soon he gets involved in organizing gigs and the record store becomes a central point of information for the local scene. Co-directors Lisa Barros D’Sa and Glenn Leyburn have taken the screenplay by Colin Carberry and Glenn Patterson and created a lively, inventive and heartfelt tribute to a scene which thrived in dire circumstances. 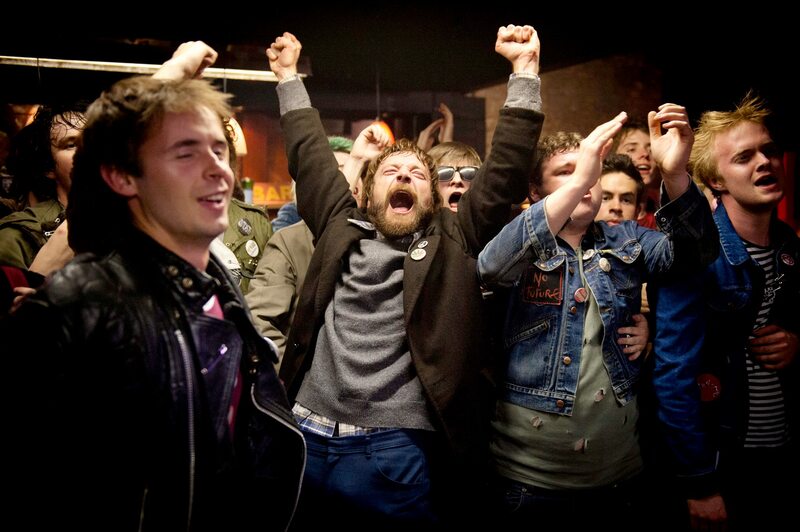 There is plenty of humour and energy in the movie, but the threat of violence pervades the lives of these Belfast punks. Terry Hooley was a controversial figure at the time, although he has since been honoured in his hometown. There are some who find the man portrayed in this biopic too flawed and unlikeable. Hooley has definite shortcomings, however I was impressed with Richard Dormer’s portrayal of the Godfather of Belfast Punk. The actor shows us a fractious, mouthy, main-chancer who refuses to let the ugliness of the times destroy his love for music or his home.